Not only is the Trading Post Cafe one of Taos' coolest restaurants (it was a beloved hangout of longtime Taos resident Dennis Hopper), it also boasts what is perhaps the best Hot Fudge Brownie Sundae in all of New Mexico. 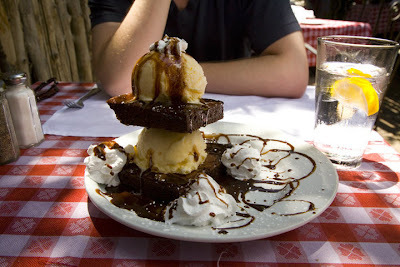 This double-decker brownie possesses the perfect balance of density and moistness, and is paired with two creamy scoops of vanilla ice cream, an almost bittersweet hot fudge sauce, and fresh whipped cream. There's nothing more relaxing than sitting in the gorgeous back garden of this restaurant under the shade of hanging plants and devouring this dessert...slowly. I love to see a grown man cry -- especially over pastry. For anyone that has every season of Top Chef on their DVR Kings of Pastry, the new documentary from the team behind The War Room, is a fall must see. KINGS OF PASTRY Theatrical Trailer from Pennebaker Hegedus Films on Vimeo.